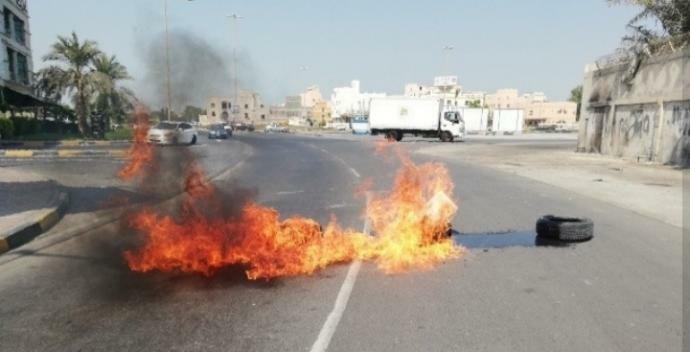 The heroic revolutionaries in the towns of Abu Saiba and Shakhoura set fire on Saturday, October 13, 2018, condemning the blatant raids, the storming of homes and the arrest of citizens. They emphasized through this revolutionary operation entitled "Do not intimidate by the arrest", which led to the cutting off of the public streets in the two towns before the eyes of al-Khalifa mercenary gangs, continuing their revolutionary movement until the fulfillment of the revolution's goals and the right of self-determination. It is noteworthy that the coalition of 14 February had granted the towns of Abu Saiba and Shakhoura the title of "Beacon of steadfastness" in March 2018, in recognition and praise to the participation of its people in the intensive revolutionary movement escalated over the years of revolution.